Originally from Port Washington, NY, Chef Will Goldfarb discovered his love for cooking when he worked as a waiter while attending Duke University. His passion for cooking developed rapidly and he decided to opt out of entering into law school to pursue a professional career in the field of pastry. Since then, Chef Will has not looked back. 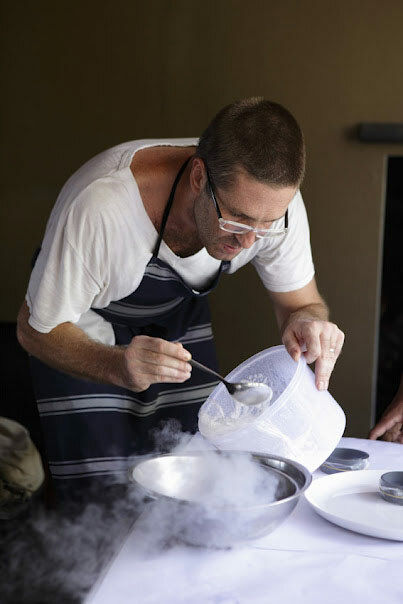 Widely known as the ‘Golden Boy’ of pastry, he has worked in the kitchens of famous names such as Ferran Adria, Tetsuya Wakuda, Paul Liebrandt and Morimoto. In 2006, he ventured out on his own to open the critically acclaimed Room 4 Dessert in New York which offered an Avant garde menu of edible dessert cocktails, plated desserts and wine pairings. Highly regarded by industry professionals and peers alike, Chef Will was named as one of the 10 Best Pastry Chefs in America by Pastry Art and Design. He also received the Starchef “Rising Star” award and earned a James Beard nomination for Best Pastry Chef in America. In addition to this, he was regarded in Ferran Adria’s recent book, Food for Art, Art for Food, as one of the world’s leading modern chefs and was identified in Lisa Abend’s book, The Sorcerer’s Apprentices, as one of the finest chefs in the world to pass through the El Bulli kitchen. ders and select natural ingredients that enhances the purest flavor in pastry and allows for the creation of differing textures and flavors in dishes. Together with New York University’s Chemistry and Food Studies Department, he also founded The Experimental Cuisine Collective, an interdisciplinary network at the nexus of food, science, and social network. gs with him a fanatical attention to detail and aesthetics, a bondless curiosity in developing new techniques and interest in the purity of flavours in his dishes. His brand of cuisine blends the finest elements of cutting edge gastronomy with traditional techniques and flavours. At KU DE TA, Chef Will oversees a team of 12 to complement KU DE TA’s modern global cuisine, ensuring a seamless transition from Corporate Executive Chef Phil Davenport’s menu while blending his innovative techniques into delicious and imaginative preparations of local and sustainable products. In this sense, Chef Will hopes to provide diners with that sweet and satisfying end to an already outstanding experience at KU DE TA.